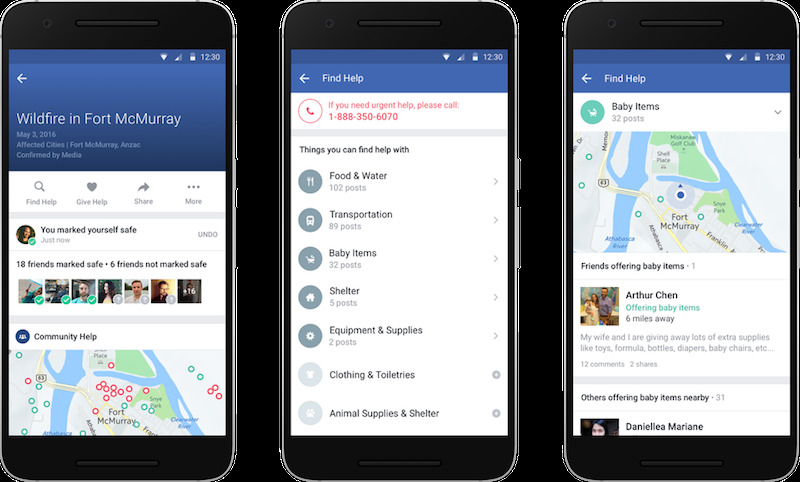 Facebook is offering new tools for charity fundraising, for marking yourself safe during a crisis and for helping others – or asking for help – after a natural disaster. The social network made the announcements Thursday in New York at its Social Good Forum, a first-of-its-kind event it hopes to repeat in coming years. The company has dozens of engineers who work on its relatively new “social good” team creating tools for users to help their friends or the world around them. A tool called “Safety Check” lets Facebook users mark themselves safe during a crisis, whether that’s a natural disaster, bombing or something else. Once someone marks themselves safe, their friends are automatically notified that they have been accounted for. At first, Facebook activated the tool in areas where disaster struck. Now, Facebook says it will stop its own activations, handing it off to users instead. How? When a lot of people are posting about an incident (stuff like “was that an earthquake?”), they might get a notification to let friends know they are OK, using safety check. If they do, they can invite other friends to do the same, and so on. Beginning early next year, a tool called “community help” will let users offer and receive shelter, food or other types of help during crises. People have already been doing this on Facebook and Twitter, using hashtags such as #PorteOuverte (open door) after last year’s attacks in Paris that left 130 people dead. But it was often difficult to pair up. The new feature aims to streamline this. People will be able to select categories to get or offer help with, such as food and water, transportation, baby items or shelter. Once they do, they can use Facebook Messenger to arrange the details. Facebook started letting charities raise money directly through its platform over the summer. At the time, users could choose from 100 US nonprofits. Now, that number is 750,000 and growing. People can also add donation buttons to their Facebook Live videos to raise money – but only for actual charities, not a dream vacation.